"Build my gallows high, baby." The femme fatale, the doomed protagonist, the atmospheric black-and-white cinematography, numerous double-crosses, an unhappy ending. These basic elements of the film-noir genre have nearly become clichés to knowledgeable moviegoers, but this was not the case in the late 1940s. Out of the Past contains all of these items, but it still maintains its relevance more than 50 years after its initial release. Directed superbly by Jacques Tourneur and the stunning camerawork of Nicholas Murasaca, this film provides a spellbinding journey into the darker aspects of the human psyche. Based on the novel Build My Gallows High by Daniel Mainwaring (credited as Geoffrey Holmes), this story introduces us to Jeff Bailey (Robert Mitchum), a gas station owner living in a small town and trying to forget a notorious past. He spends his free time fishing at a nearby lake with his beaming love Ann (Victoria Huston), who ignores her parents' objections and sees him anyway. Everything seems idyllic, but it quickly changes with the arrival of Bailey's old pal Joe Stephanos, who is not just making a social call. It seems that Bailey (then known as Jeff Markham) once double-crossed a powerful guy named Whit Sterling (Kirk Douglas), who may want to gain his revenge. While Ann drives him to meet the very rich hood, Bailey describes the troubling events from the past. Will he be able to escape a dire fate this time? What about the femme fatale, you ask? This stunning gal's name is Kathie Moffat (Jane Greer), and she plays a pivotal role in both the past and present-day events. Sterling initially hired Bailey to track and return his lady (Moffat), who had run off with his money and dignity. Predictably, our hero falls for the bad girl, and this leads to unfortunate results. Once again, she's involved in Sterling's life, and her guile may lead Bailey to utter destruction (or possibly redemption). Moffat never goes over the top with the charm and instead ensnares men by controlling them. Following his meeting with his former boss, Bailey must travel into the big city and match wits with an array of foes to avoid prison or death. The resulting twists and turns aren't always easy to follow, but they're always presented with entertaining style. This film succeeds largely due to its superstar cast all working in the early stages of their careers. Mitchum is the perfect bad boy and is rarely matched by any film noir protagonists ever again. He talks fast, smokes like a chimney, and always seems one step ahead of everyone (except the girl). Speaking of the lady, Jane Greer delivers a performance that would inspire actresses like Faye Dunaway and Kathleen Turner many years down the road. The only foe who makes her quiver is Douglas' Sterling, who brings the actor's raw physicality to the forefront. In only his second film, the 31-year-old Douglas insinuates plenty while only raising a hand at one pivotal moment. The supporting cast of shady characters all do a solid job and lend impressive credibility to the tale. 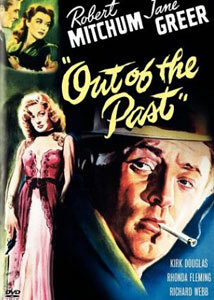 Out of the Past stands as one the premier films in the entire noir genre and still delivers an enjoyable ride today. It also shows modern directors that a picture can be intense with almost a complete lack of violent moments. The director, writer, and actors succeed through ingenious dialogue, clever shooting, and the dark tenets of the genre. Even viewers who dislike this movie type should catch this story just for the effectiveness of Mitchum's performance. He always stays cool under pressure and might live to see another day, but cinema history is not on his side. Image Transfer Review: Out of the Past appears in its original full-frame format and provides clear visuals throughout the movie. There are few defects on the print, which is impressive considering the film's significant age. The black-and-white cinematography is especially impressive, with the dark film noir tones springing nicely from the screen. It falls a bit short of the best older transfers, but this release still provides a worthwhile experience. Audio Transfer Review: This release utilizes a mono transfer that has been remastered to offer a clear sound. The sharp dialogue is clear and easily understandable, which is important for the complicated plot. The soundtrack also avoids the fuzziness sometimes present in the audio from older films. There's nothing particularly amazing about this transfer, but it does provide a solid presentation. Extras Review: The lone extra feature is a commentary track from film noir expert James Ursini, who has penned numerous books about the genre. His expertise is apparent throughout the film as he describes the typical aspects prevalent in Out of the Past. Ursini also gives a significant amount of plot summary that is mostly unnecessary, but he seems concerned with the audience understanding the story. His statements are generally interesting, but it would have been nice for him to delve even deeper into the historical context. We learn some tidbits about the actors, director, and locations, but he fails to provide the compelling information given by some experts. It's still a worthwhile track and worth a listen, but it falls a bit short of being overly memorable. Out of the Past is long overdue for its proper DVD release, and this disc nearly delivers all the necessary goods. I would have enjoy a comprehensive documentary or a more impressive commentary, but it's hard to complain about the overall presentation. Mitchum, Greer, and Douglas have rarely been better, and this classic will hopefully inspire a new legion of new cinephiles to explore the genre.